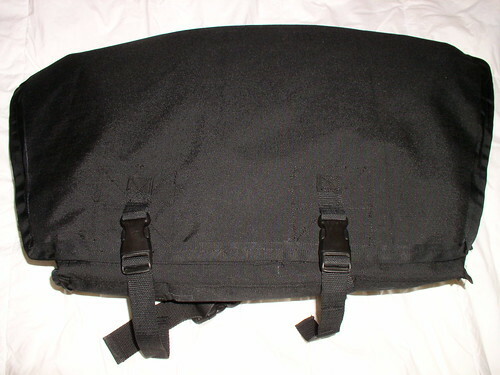 Black nylon cloth, gray tarp material, and padding. I then measured out the dimensions I needed and cut out all the pieces. 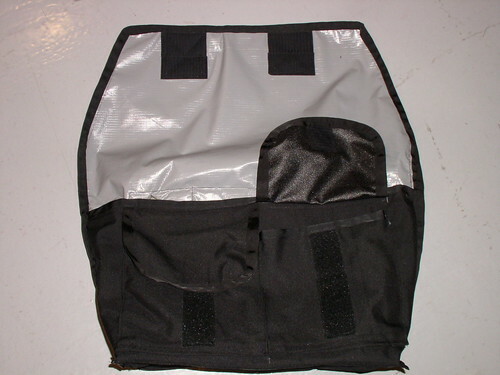 I made this bag from one piece of material not counting the liner and padding used. I would suggest to make your bag from a couple of smaller pieces and puzzle them together. It was difficult to maneuver one big piece in and around the sewing machine. 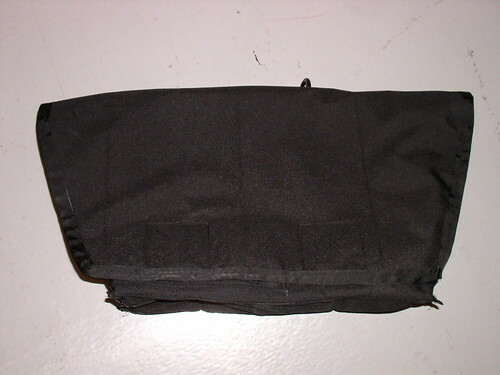 Here is what the bag looked like once everything was sewn together. After looking at how plain this bag looked, I decided to put some pockets underneath the cover flap. This procedure should have been done prior to puzzling the bag together. It would save you so much time and effort if you plan out exactly how you want your bag to look like. Something I figured out after the fact. 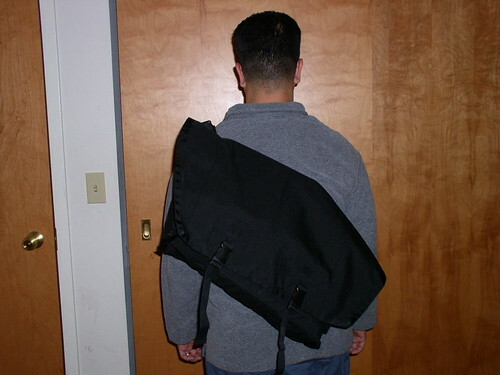 The last thing I worked on was the shoulder strap. I wanted to have an interchangeable from a right hand to a left hand user bag. This process is what took the longest. The shoulder strap is what Iâ€™m proud of the most. 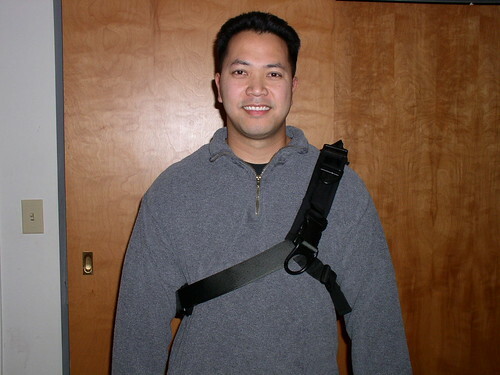 Materials used were scrap black nylon cloth, padding, metal buckles, plastic quick release, and a nylon belt. 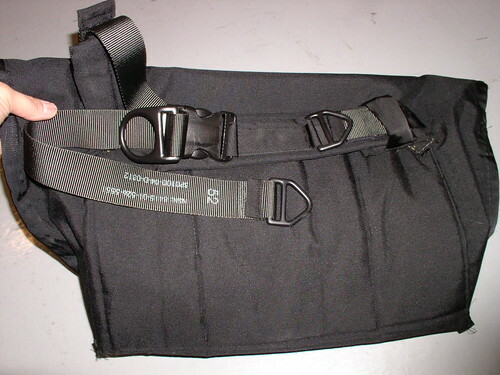 Interchangeable shoulder strap with optional waist band. Evomo Clothing has to be one of the coolest mountain biking clothing companies out there. 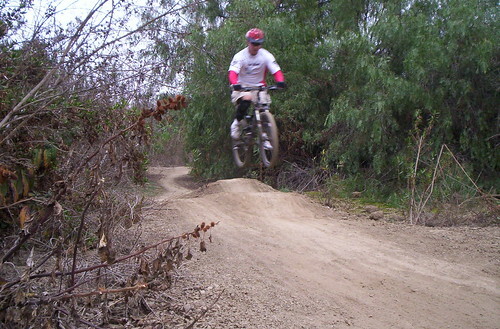 Evomo is the most progressive lifestyle clothing brand to hit the mountain bike scene. They are a skate and surf inspired casual clothing line created by mountain bikers. So you know what this means to us mountain bikers? It means we can actually look cool and show off that we ride! Oh Heck YEAH! I’m all over that like white on rice. Here’s some samples of what Evomo has to offer. They have a boat load of cool things just for mountain bikers, so don’t hesitate to check it out! We’ve had some great entries for the contest so far. But I have to warn you. When you enter the contest, PLEASE give me a good answer. Not like, “my answer is 17” (that was courtesy of Jon Ruiz of Ontario…ssshhhhh don’t tell him I used his answer….). Seriously, the answer is super easy to find. In fact, we’ve had some multiple correct answer…even from MALAYSIA! Dang that’s far! If you still haven’t entered our Contest for the Tifosi Forza glasses, you still have time. The contest ends on the 7th. C’mon, just look at these…nice eh! I was pretty impressed to learn that Woodstock Bikes posts on their site comparisons between parts and prices against other manufacturers. So I looked at the 2007 Specialized FSRxc Comp and compared it to the Woodstock 707 and I was surprised to see the savings was well over $700.00. You can see for your self, HERE. Ever wondered what some of the terms in italics mean? You can always check the Mountain Biking Slang Dictionary. Not only are they great in transporting our bike around. But they are actually pretty useful. For a long time I didn’t own a work stand. So I used the next best thing, my trunk mount rack. 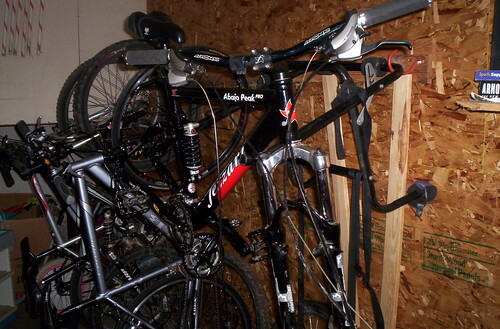 All I did was get some hooks and place them on the wall and mount my rack when ever I needed to work on a bike. Heck if you need to make some last minute adjustments at the trail head, you can easily work on your bike. Place the cardboard on top of the rack and poke some holes for some zip ties. Viola! There’s your finished product….a nice spoiler! I’m thinking of testing it to see how well it keeps my rear end glued to the ground while I’m getting groceries. I hope that helps, since that DIY modification just saved you hundreds of dollars from buying one of them spoilers that are made our of aluminum! For those of you who are saving up or waiting for your tax return to buy a new bike, check out what some of our PARTNERS have to offer before you blow all that money on some name brand. I know your wallet would thank you for it. Man…I wish I could do half of this stuff…. I’ve learned from a few bicycle mechanics and shop owners that using automotive bearing grease is perfectly fine when repacking your hubs, headset and even older style bottom brackets. The only difference between a Park Polylube 1000 and the automotive grease you get at Wally World or the Parts store is its water proof. But you should be fine using the cheaper stuff for your hubs and stuff. That tip right there just saved you at least $8 since a tub of Park Polylube can cost up to $10 and the automotive stuff is about $2. Which MtnBikeRiders.com Staffer Is This? 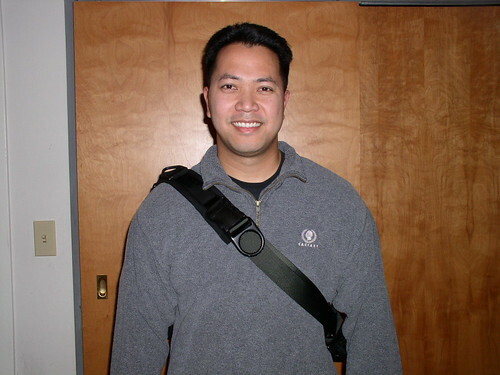 I found this old photo of one of the guys of the site. Can you guess who it is? Hmm…I’ll give you a hint.